My sister over at the Pumpkin Patch is an applique goddess. She works on all those fancy wool projects and spits out her completed pieces without breaking a sweat. Me? I have some issues. I have not found the right project for me. 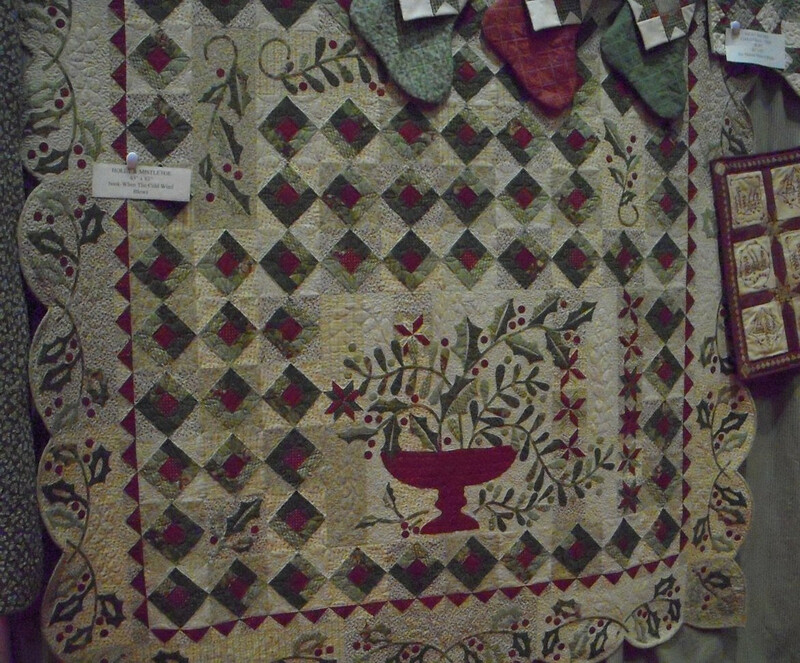 Karen over at Log Cabin Quilter is also a queen at her applique. I'm always drooling over her work and I'm just plain jealous that I cannot find the patience and commitment to follow through on an applique project. To my dismay my January Guild retreat was full of wondrous applique projects. I finally broke down and decided I needed to find the right project. I searched through all my books and patterns and even bought a new pattern, but in the end I decided to tackle one from the gals over at Blackbird Designs. 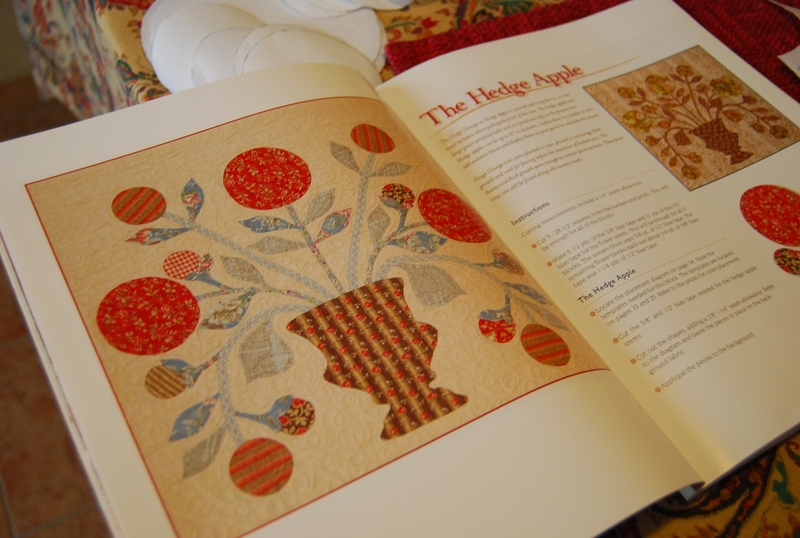 I bought this book over the holidays because I am in love with the Holly Leaf quilt I saw at the Houston Quilt Festival a couple of years ago. 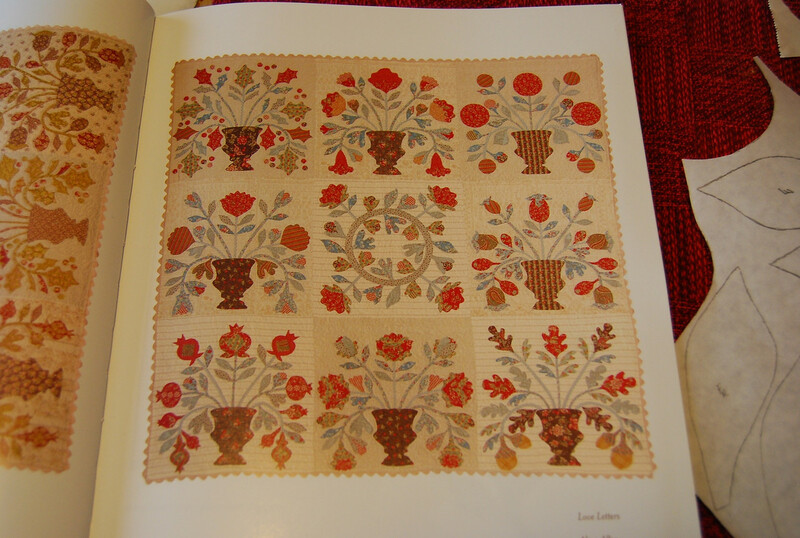 But, the book has several gorgeous quilts to chose from. Among them is this piece. I have noticed that some quilt shops are actually making this as a block of the month. I loved this colorway and thought that I could try and tackle it. This is the first block. And this is the mess I made getting ready. LOL! 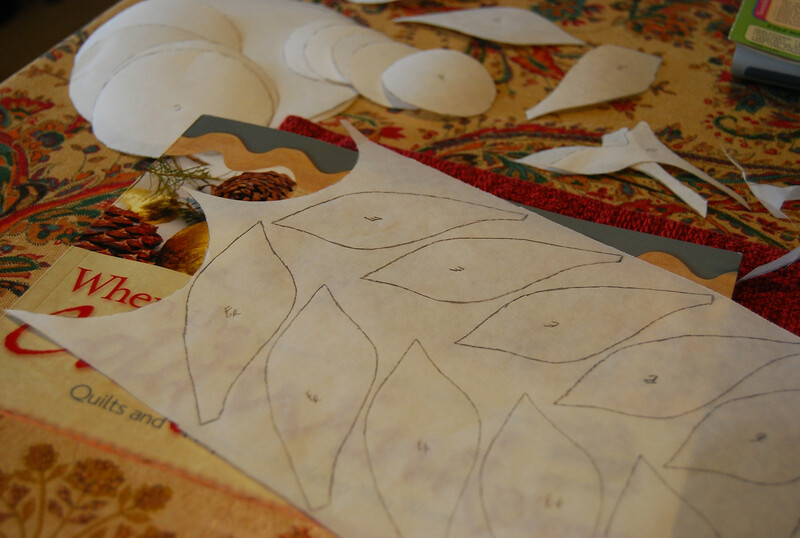 I use freezer paper to get the templates. 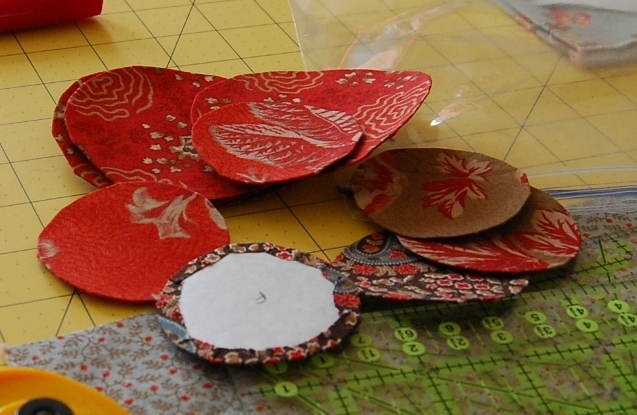 The gals at blackbird designs suggested we stack and cut instead of tracing each individual piece. I admit, I never even thought of that. duh! I then use my handy dandy glue stick and glue the edges over. Here is a close up of some of the circles I got done on Monday. I've used a regular Elmers glue stick in the past but since I had to buy the Sewline Glue Pen for the Bali Wedding Star project, I just grabbed that. I use this method instead of the traditional needle turn because I am not coordinated enough to get the pieces folded over in the right spot. Also, this allows me to do a bit on machine if I want. After I have the pieces made, my next step will be to place on the background and using a few dots of Roxanne Glue Baste-it, set it in place. So, to those that have done it before.. any suggestions? Shortcuts? I'll post on my progress, but would love to hear your thoughts. Maybe I can try another method for the next block. 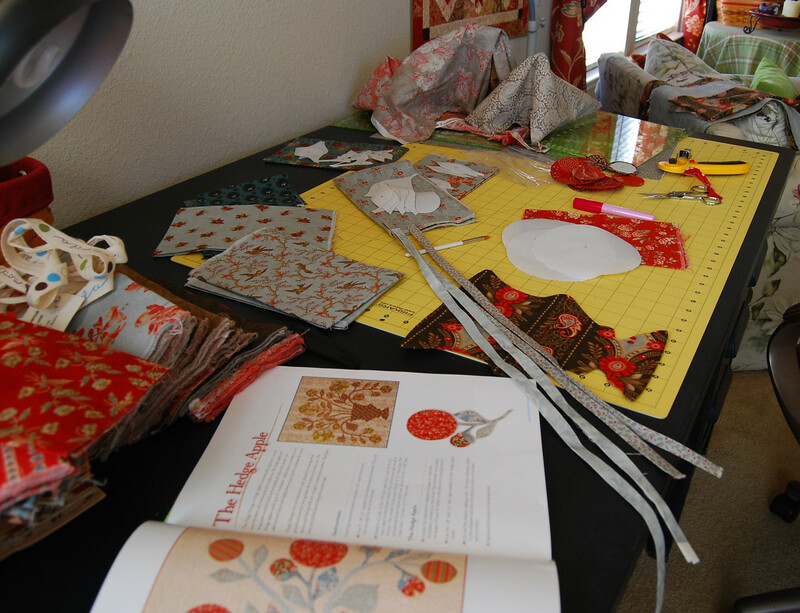 In the meantime, you should check out Thelma's applique project over at her blog. She is also working on a Blackbird Design but from another of their titles. 6 comments on "Applique? Anyone?" WOW, Congratulations Sandy, you're off and going! Your first project is a bigger challenge than mine, you have 3 times more pieces and they are so small! Our methods are different too, my teacher is more of a traditionalist, no glue in our work!! I recognize Park Avenue on your sewing table, great choice for your applique project. Good luck with appliqueing those pieces on your background fabric, I'll be watching for that first completed block! So THAT's why you're having a hard time. Could you have picked something a teeny wee bit more challenging? EEKS! Are you leaving thefreezer paper in there and pulling it out the back or just using it for prep work? And what's wrong with using wonder under? LOL! I can't wait to see yourcompleted block. If you hate it you know you can make it into one killer pillow, with a sawtooth border to show off your real quilting skills, hahahaha! OMGoodness! You are seriously challenging yourself with this project. I don't have much patience for applique but love it! You are right that Karen at Log Cabin Quilter is a PRO!! I know this first hand!! Best of luck...I'll watch your progress with admiration! Sandy, it's going to be stunning. I'm beyond excited for you. I think you chose a perfect project - nice big pieces with wonderful results. I'll be watching your progress. 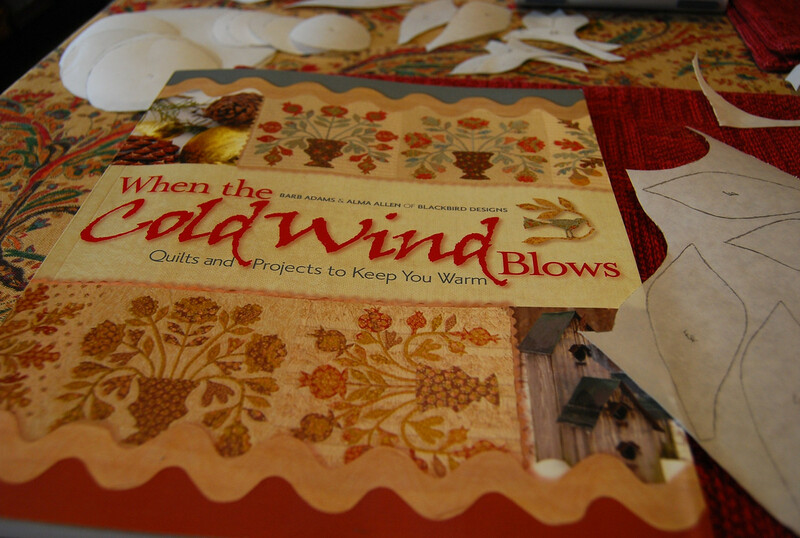 I'm ready to try some applique too, bought a dvd and book to study before I get started. I think it will make a good summer project for me. Anxiety to get something done. PW is in the house!! !